Former Nigerian sprinter and African 100m current record holder, Olusoji Fasuba has urged Nigerian athletics enthusiasts to forget the country’s athletes making a good showing at the 21st African Championships starting August 1 in Asaba, Delta State. Fasuba who won two African championships 100m titles in 2006 and 2008, said Nigeria has no strong team to mount a challenge to the rest of African, however, the country can do well in the area of hosting a sucessful championships that will be a reference point in African athletics. “We have no team and even at that there is no good preparation. So we are just going to show Africa that we can be good hosts and we can show them how beautiful the Stephen Keshi Stadium is. “Our athletes cannot only hope for a good performances. But if you ask me I will just say let us put our house in order and plan for the future,” said Fasuba who holds the African record 9.88 seconds since 2006. Meanwhile it was gathered that out of the legion of foreign-based athletes being expected, only long jumper Ese Brume and 1500m runner Aminat Olowora have reached Ozoro venue of the athletes camp. “Because of the nature our preparation we could get most of the foreign-based in camp. 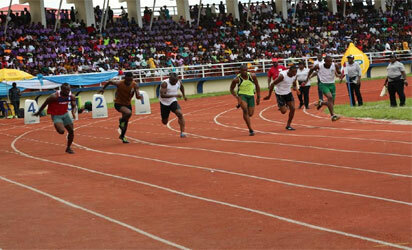 However , we expect them to join in Asaba before the start of the championships,” said one of the coaches in camp. One athlete in a race to meet up is long jumper Mercy Abire. It was gathered that her passport has expired and she is in the process of getting a new one to enable her take a flight to Nigeria.